Incisive questions are the tools of all great leaders. 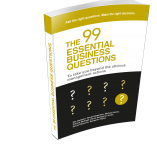 Most of our 99 Questions can be further extended using a technique to turn them into incisive questions. First, strip out limiting assumptions from your answers! Take a look at our question No. 16. How do I ensure the welfare of my team? There’s not much I can do, because the important controls are managed by Human Resources. Tackling that limiting assumption, the reformulated incisive question might then read, If I controlled the influence of Human Resources, how would I ensure the welfare of my team? This now frees you to explore the options, and to encourage participation in effective action. Second, having answered the Question, then reformulate the Question in the light of your answer so as to replace the limiting assumption with a liberating one. For example, you want to talk to your boss, but feel you can’t do it. Ask yourself, What might you be assuming that is stopping you? You reply, I’m afraid he’ll simply laugh at me and think I’m stupid. After more thought, you realise that you too are assuming that you are stupid. The assumption sits there, holding you back, limiting your thinking. A colleague might say, So what if he laughs? You’e not stupid; go and talk to him! You say, OK, but still you put it off… just telling you to do it won’t work. But a question will, because, unlike a statement which requires you to obey, a Question requires you to think. Third having rephrased the Question to replace the limiting assumption, form your next question by replacing your limiting with an appropriate liberating one. The key to forming this next question is listening with precision in order to reformulate the question. If you knew that you were intelligent [the liberating assumption], how would you talk to your boss? If you were not to hold back in your life, what would you be doing? If you knew you were vital to this organisation’s success, how would you approach your work? If you were to become chief executive, what problem would you solve first, and how would you do it? If things could be exactly right for you in this situation, how would they have had to change? If you knew something wonderful was going to happen today, how would you feel? Note that the first part of each question asserts a positive assumption; the second part directs the thinker’s attention back to their issue or goal. And when you get stuck? Use incisive questioning to identify your own assumptions and create your own questions to remove them. Ask yourself, What am I assuming here that is stopping me? Listen to the answer, which might be, I am assuming that I don’t deserve success here. Then strip out that assumption and form a new question If I knew that I do deserve success here, what would I do right now? If you want to feel better, ask yourself, What am I assuming that is making me feel depressed? Note the answer, I am assuming that I have no choice here, that I am powerless. And then remove it, If I knew that I do have a choice here and am powerful in this situation, how would I feel? If your team has run out of good ideas, ask yourselves, What might we be assuming here that is limiting our thinking on this issue? Remember the answer, which could be, We are assuming that only the top people can think about this adequately. Then remove it, If we knew that we can think about this as well as anybody, what would our ideas be now?